All Burlington Baths are made over 10mm thick with double sided acrylic, ensuring a long life and improved heat retention properties. 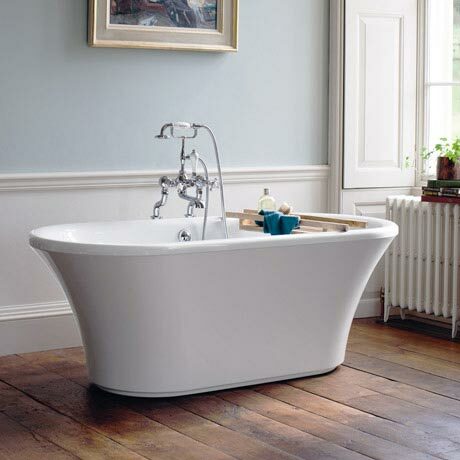 All Baths have adjustable legs (so you can even level your bath on an uneven floor) and concealed fixings (so that you can fix the leg into the floor, for complete stability). All our baths are made over 1 centimetre thick with double sided acrylic - ensuring a long life and improved heat retention properties. Brindley Soaking Tubs are supplied without an overflow (a template is provided for on-site drilling, if required). Taps cannot be mounted on the Soaking Tub ledges. * Volume of water contained in the bath if filled to the overflow. ** Volume of water contained in the bath if filled to the overflow less 70 litres to allow for an average person in the bath.